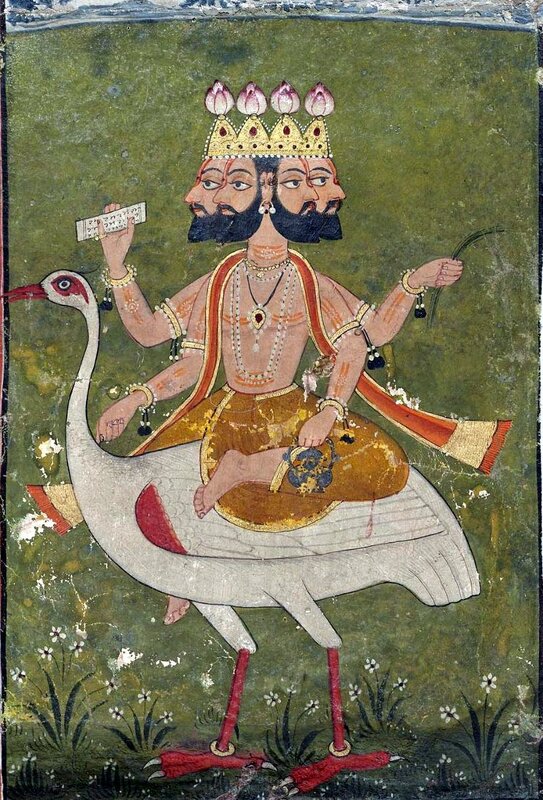 Brahma is the Creator and Sustainer of the universe and is known by many names, the Divine Absolute, Grandfather, One, Namely, the Universal, the Eternal Spirit pervading the universe, the Unborn, and so on. To create the universe Brahma separates into male and female, Father and Mother, Vishnu and Lakshmi, heaven and earth, day and night, inhalation and exhalation, and we are the descendants. Brahma is One and splits into two while remaining the same, and just as, there are three winds, breaths, for living, to and from to live with and to be devoted to arise in. We are all connected upon the earth, and the teaching is for all of us to live as one big happy family. Heaven and earth are outside of us for a place to exist and inside of us for rising to heaven. Brahma separates out of love for all beings, separates for comparison, for conceptions, and without that, there is no thought but one. The picture accompanying this post is called Brahma on Hamsa. In the literature, you will find that Hamsa is the name of a bird, a swan, and some writers equate Hamsa with Hamso, which is the name of a mantra for meditation. Hamso is referred to as the Mantra of Breath, but it is different than the Mantra of Breath in the Vedas. In the Veda, the Sacred Knowledge, a person listens to the sound of the breath for meditation, and does not chant the syllables SO and HAM on exhalation. A person breathes and listens, breathing produces a sound, and for the purpose of meditation, a person listens to the inhalation of the breath through the nose and exhalation from the mouth. Neither Hamsa nor Hamso is in the Sanskrit-English Dictionary. Haṉsá is in the dictionary and means a swan, a goose, the soul or spirit, the Supreme Spirit, one of the vital airs, a kind of measure, or a kind of mantra. The Sanskrit “ṉ” is similar to “ṃ” in having the sound of “n” in bon. Some writers equate Hamso with Soham and in the dictionary, you will find So ‘ham, and it means I myself. Kind of interesting, but more interesting to me was finding a picture depicting Brahma, the Eternal Spirit, riding Haṉsá, the Supreme Spirit, and finding that the word also refers to a kind of measure or mantra. Brahma comes and goes with respiration, the Mantra of Breath, and will come to you as long as you have the strength to return the breath to Brahma. Here is a verse from the Sacred Text about a number for comparison. The two must be equal to be powerful to dwell in the same place and unite in the same ceremony worshipping night and day together, and for the sake of mortal couples, the Ancient One reproduces and is born young so there is great uniformity forever. This entry was posted in The Rigveda and tagged Brahma, Breath, Buddha, God, Mantras, Religion and Spirituality, Religious Text, Rigveda, Sacred Text by rgvedaschool. Bookmark the permalink. When I read the posts and pages of the Rgvedaschool, I know I am not wasting my time since I am learning from the Guide Book.